Looking for the perfect meatless entree? Look no further! This roasted brussels sprouts salad with dijon vinaigrette is a MUST make this season! Not only is it meatless but it is Whole 30 compliant and vegan!! Now that’s what I call an added bonus! The combination of creamy potatoes, crispy string beans, and tender roasted brussels sprouts is absolutely amazing! Which is why I have no problem serving this at a dinner party as the main course (yes, it’s that good!) or as a stunning side dish that everyone will be oohing and aahing over. I usually opt to make this as a stand alone vegetarian dish since the potatoes are incredible filling. However, you can always add more protein if your heart desires. Easily add some rotisserie chicken or grilled steak for an even more filling entree. Plus, you can customize it based on your tastebuds. If you are not a big fan of dill, feel free to swap it out for another flavourful herb such as tarragon. Put this on your weeknight rotation soon — you will be so impressed with how quickly it comes together and the intense flavour it packs! I’m not going to lie, I made this twice in one week because yes, it was that good! 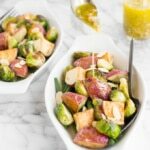 This roasted brussels sprouts salad with creamy potatoes, crispy string beans, and dijon vinaigrette makes for a delicious vegan meal this season! Preheat oven to 400 F. Toss potatoes in a large bowl with 1 tablespoon olive oil, 1/2 tablespoon kosher salt, and 1/2 teaspoon black pepper. Roast on a baking sheet for 20-25 minutes, tossing once halfway through cooking time. 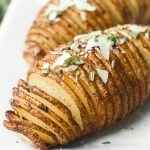 Potatoes should be crispy on the outside, but creamy in the middle. 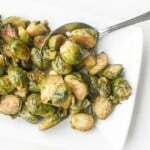 Cut brussels sprouts in half through the core and place in a medium bowl. Toss with 1 tablespoon olive oil, 1/2 tablespoon kosher salt, and 1/2 teaspoon black pepper. Roast on a baking sheet for 12-15 minutes, or until edges begin to brown and brussels sprouts are tender and no longer bitter. 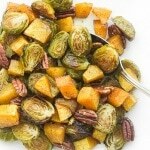 While potatoes and brussels sprouts are roasting, bring a large pot of water to a boil. Add 2 tablespoons of salt and drop in green beans. Cook for exactly 3 minutes and then place directly in an ice bath to stop cooking process. Drain after 5 minutes. 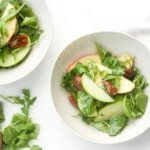 To make the dressing, combine extra virgin olive oil, apple cider vinegar, dijon mustard, dill, shallot, salt and pepper in a small mason jar (or any other container with a lid). Place lid on top, seal, and shake until well combined. To assemble, layer potatoes, brussels sprouts, and string beans on one large platter or in individual serving dishes. Top generously with salad dressing. 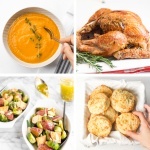 Serve while warm or at room temperature. Top with sliced almonds (optional). The dressing will keep in the refrigerator for two weeks. These sound delicious! Definitely pinning this recipe for later.